Pressure washers, pressure washer pumps, parts and accessories brought to you by Pressure Washer Authority. We are working hard to build out our Online Warehouse, pressurewasherauthority, for your convenience. Let us help you Clean Up! 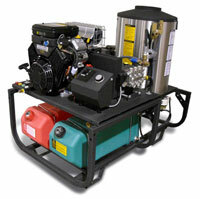 4,000 PSI 13HP 4.0 GPM Cold Water Gas Pressure Washer with General pump and accessories. Suttner ST-357 Turbo Nozzle pumps through tough jobs and cuts cleaning time in half! We are ready to assist you with your pressure cleaning needs and purchases of pressure washer pumps.